BERLIN 01.-09.01.2008 Call for Participation Berlin Radio activists will host „Liberation Radio Week“ transmissions Jan 1-9,2008 LIVE and ON AIR from Berlin. Berlin Free Radio will be listenable via multiple micro-fm transmitters and an internet stream, fully legal but without license. 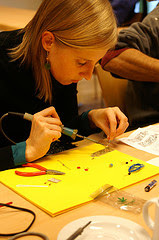 * We want to demonstrate both the necessity of a live and active community radio, and the ease by which it can be made in Berlin and everywhere. Each day of programming will feature reports from sister projects around the world, beginning with Africa, Asia, and the Americas, and in the days following, reports from around Europe, and finally (in primarily German language) a focus on the current activity in the Federal Republic of Germany, with a full day to discuss the various radio initiatives in Berlin. Ways you can support the project: 1. Re-broadcast and/or relay the live stream by whatever means accessible 2. Contribute reports from your region and neighborhood 3. Spread the word by linking to Mikro-FM site and posting the news of Liberation Radio Week on net lists and community bulletin boards For more info: http://www.mikro.fm (english version soon) Contact and feedback: info@mikro.fm * In Berlin, Brandenburg broadcasting on the airwaves requires a license, which is only purchasable through the MABB ( MedienAnstalt Berlin Brandenburg, which regulates all broadcast media in the Berlin region). Mikro FM is based on the community radio innovations of Tetsuo Kogawa, which in this local circumstance does not violate the media laws. The founder of the Micro Radio Movement is Tetsuo Kogawa. 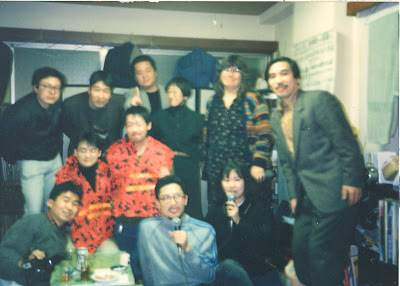 He is on the right in this photo, taken on the occasion of DeeDee Halleck's visit to the site of his long running radio program, Radio Home Run, in Tokyo. A paper giving the history of Radio Home Run and the Micro Radio Movement is on nettime.